A faint star in the southern Milky Way, designated HE 0107-5240 , has been found to consist virtually only of hydrogen and helium . It has the lowest abundance of heavier elements ever observed , only 1/200,000 of that of the Sun - 20 times less than the previous record-holding star. This is the result of a major ongoing research project by an international team of astronomers . It is based on a decade-long survey of the southern sky, with detailed follow-up observations by means of the powerful UV-Visual Echelle Spectrograph (UVES) on the 8.2-m VLT KUEYEN telescope at the ESO Paranal Observatory in Chile. This significant discovery now opens a new window towards the early times when the Milky Way galaxy was young, possibly still in the stage of formation. It proves that, contrary to most current theories, comparatively light stars like HE 0107-5240 (with 80% of the mass of the Sun) may form in environments (nearly) devoid of heavier elements. Since some years, astronomers have been desperately searching for stars of the very first stellar generation in the Milky Way, consisting only of hydrogen and helium from the Big Bang. None have been detected so far and doubts have arisen that they exist at all. The present discovery provides new hope that it will ultimately be possible to find such stellar relics from the young Universe and thereby to study "unpolluted" Big Bang material. The Milky Way galaxy in which we live formed from a gigantic cloud of gas, when the Universe was still young, soon after the initial Big Bang. At the beginning, this gas was presumably composed almost exclusively of hydrogen and helium atoms produced during the Big Bang. However, once the first stars formed by contraction in that gas, many heavier elements were built up by nuclear processes in their interiors. As time passed, many of the stars of this and following stellar generations returned the processed matter to their surroundings at the ends of their lives, either during violent supernova explosions or via strong "stellar winds". In this way, the interstellar gas in the Milky Way system has ever since been continuously enriched with heavier elements. Stars of later generations like our Sun now contain those elements produced by their ancestors and we are indeed ourselves made up of them. Consequently, the early (and hence, old) stars in the Milky Way mainly differ from younger stars by containing very small amounts of such elements . Have some of those earliest stars survived to our days? In theory, at least, it would be possible that some of the lighter ones - having the longest lifetimes - are still around. But if so, where are they? During the past three decades, astronomers have desperately tried to find bona-fide representatives of the very first stellar generation(s) in the Milky Way, i.e. stars with no or, at most, extremely low abundance of elements other than hydrogen and helium. The researchers usually refer to such objects as Population III stars, the other two populations being stars with heavy-element abundances like the Sun (Population I) or somewhat less (Population II) . Now, a group of astronomers from Germany, Sweden, Australia, Brazil and the USA  has found a giant star that has a concentration of heavy elements 200,000 times lower than the Sun, or about 20 times less than the previous "record" for this kind of star. It thus provides the researchers with a unique window towards the early stages of the formation of the Milky Way and a fine opportunity to study stellar gas with a composition close to that produced during the Big Bang. This is one important outcome of a systematic search for the most metal-deficient stars that is currently being carried out at Hamburger Sternwarte . Over a period of more than 10 years, a large collection of photographic pictures of the southern sky were obtained with the ESO 1-m Schmidt Telescope, a wide-angle telescope at the La Silla observatory in Chile that has now been decommissioned. Thanks to a large glass prism in the front of the telescope, every object in the observed sky field - stars as well as galaxies - was imaged as a small spectrum, providing a first rough idea about its type and composition. The main aim of this "Hamburg/ESO survey" (with Dieter Reimers, Associate Director of the Hamburger Sternwarte, as Principal Investigator and Lutz Wisotzki, now at Astrophysikalisches Institut Potsdam, Germany, as Project Scientist) was to find quasars (particularly active centres of galaxies), a task that was accomplished most successfully. A very welcome by-product of this survey has been a rich harvest of very metal-poor stars . This part of the project is led by Norbert Christlieb, also from the Hamburg Observatory, and now on sabbatical leave at the Research School of Astronomy and Astrophysics of the Australian National University (Canberra, Australia). Using fast computers and advanced pattern-recognition software to analyze the photographic exposures and thus to sift through millions of registered stellar spectra, about 8000 candidates for very metal-poor stars were found. These stars are now being scrutinized spectroscopically one-by-one with many medium-sized telescopes all over the world. Confirmed candidates are then observed with the largest telescopes in the world in order to obtain very detailed spectra (of high spectral resolution), which allow the astronomers to determine their chemical composition accurately. One of these stars has been designated HE 0107-5240 ("HE" stands for Hamburg/ESO Survey, and the number denotes the approximate position of the star on the sky). It is about ten thousand times fainter than the faintest stars that can be seen with the unaided eye. It is located in the direction of the southern constellation Phoenix, at a distance of about 36,000 light-years. This star was observed in December 2001 with the UV-Visual Echelle Spectrograph (UVES) on the 8.2-m VLT KUEYEN telescope at the ESO Paranal Observatory (Chile). From these spectra, Norbert Christlieb and his colleagues at the Dept. of Astronomy and Space Physics, University of Uppsala (Sweden) and at the Munich University Observatory (Germany) were able to determine the chemical composition of the star. 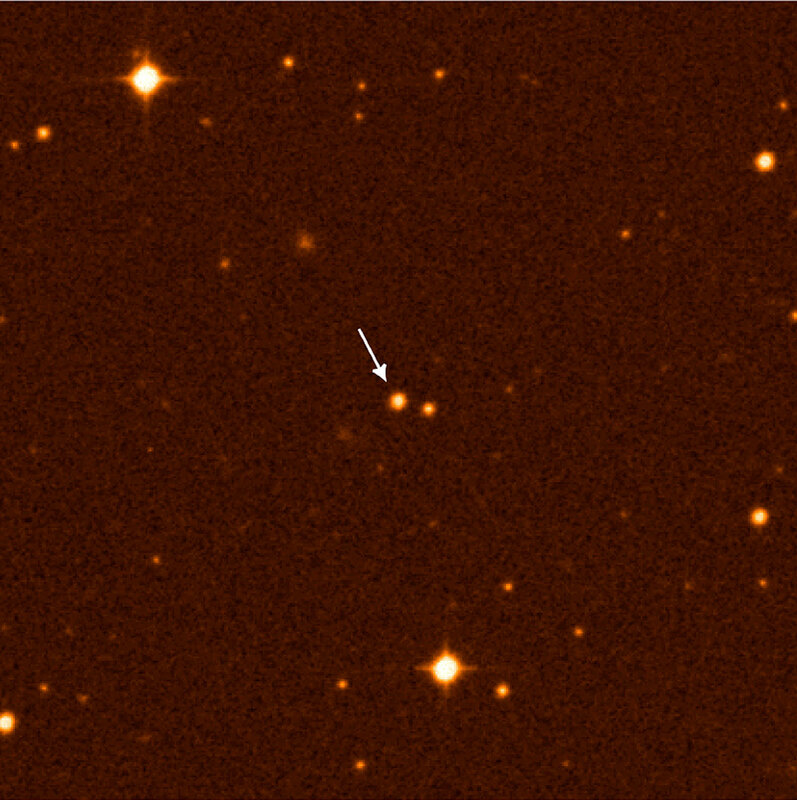 HE 0107-5240 turns out to be the most metal-poor star known to date . "This is, in a way, the closest we have ever come to the conditions directly after the Big Bang by studying stars", says Norbert Christlieb . 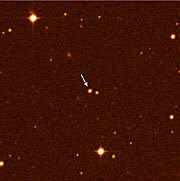 "But obviously, a lot must have happened between the Big Bang and the formation of this star. In spite of its extreme metal-poorness, it evidently contains some metals, and they were most probably formed in a even earlier, massive star that exploded as a supernova". Bengt Gustafsson from the University of Uppsala, who lead the chemical analysis jointly with Christlieb, adds that "this star also has an abnormally large content of carbon and nitrogen. Those elements may possibly have been formed by nuclear reactions with helium and hydrogen deep inside the star and subsequently transported upwards to the stellar surface where they can now be observed. It is also possible that a neigbouring star at the end of its life 'polluted' our star by transferring some of its enriched material to HE 0107-5240 at that moment. The ongoing observations with UVES will help us to decide which scenario is the most probable." The mass of HE 0107-5240 is about 80% of that of the Sun. This discovery thus clearly demonstrates that stars with masses slightly less than the Sun can form from very metal-poor gas. This is unexpected, as most current theoretical calculations indicate that it is very difficult to form low-mass stars shortly after the Big Bang, because metals are needed to efficiently cool gas clouds as they contract into stars. But now HE 0107-5240 reveals that Nature has found a way to achieve the necessary cooling. It therefore appears that many of the model calculations must be refined. Equally important: if a star like HE 0107-5240, with about 0.8 solar mass and 1/200,000 of the metal content of the Sun, did indeed form in the early Universe, then it should also have been possible for low-mass Population III stars to form . If so, they would have survived until today. This implies that there is new hope to find them by means of large, systematic searches like the Hamburg/ESO Survey. Until now, follow-up spectroscopic observations - which are necessarily quite time-consuming - have only been made of about one-quarter of the 8000 low-metal-abundance candidate stars identified in that survey. It is therefore not excluded that a bona-fide Population III star may eventually be found in the course of this programme. This press release is issued in coordination between ESO and Hamburger Sternwarte in Germany. The team consists of Norbert Christlieb (Hamburger Sternwarte, University of Hamburg, Germany; on sabbatical leave at the Research School of Astronomy and Astrophysics, Mount Stromlo Observatory, Australia), Michael S. Bessell (Research School of Astronomy and Astrophysics, Mount Stromlo Observatory, Australia), Timothy C. Beers (Department of Physics and Astronomy, Michigan State University, East Lansing, USA), Bengt Gustafsson, Paul S. Barklem, Torgny Karlsson, Michelle Mizuno-Wiedner (Department of Astronomy and Space Physics, University of Uppsala, Sweden), Andreas Korn (University Observatory Munich, Germany) and Silvia Rossi (Instituto de Astronomia, Geofísica e Ciencias Atmosféricas, Universidade de São Paulo, Brazil). Most stars in the Milky Way galaxy move within the disk, and for most of these, 1 to 2 percent of their mass consists of chemical elements that are heavier than hydrogen and helium; this is also the case for the Sun, which at 4.6 billion years is about one third of the age of our galaxy. There exists, however, another population of stars for which the heavy-element abundance is only 1/10 - 1/1000 of that of the Sun. Those stars are found in globular clusters, but most move in a huge swarm around the disk, in the halo of the Galaxy. These "halo stars" were born when the Milky Way galaxy was young and their motions still carry the imprint of the process by which our galaxy formed, when gravity brought the gas together and the first stars appeared. The "halo stars" are said to belong to "Population II", in contrast to the younger stars in the disk (like the Sun) that are referred to as "Population I" stars. 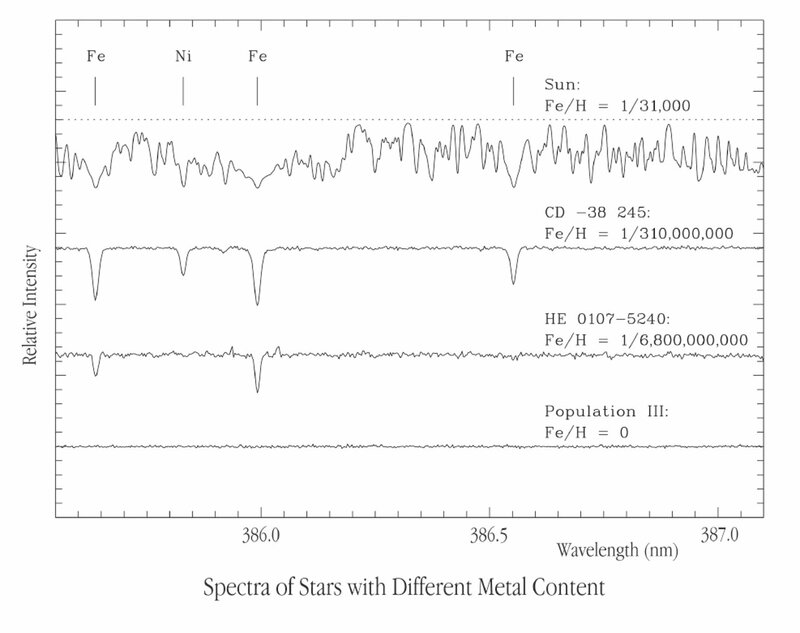 But what is then the origin of the small amount of heavy elements in Population II stars? There must have been supernovae and other exploding stars in the very early (or even pre-) Milky Way gas, out of which Population II stars were formed. This first (still hypothetical) stellar generation has been named "Population III". There have been many attempts to find Population III stars, which are then presumably totally void of metals, but those searches have not succeeded so far. Astronomers refer to elements heavier than hydrogen and helium as "metals". Stars with a low abundance of heavier elements are thus referred to as "metal-poor" stars . The information presented in this Press Release is based on a research article ("A stellar relic from the early Milky Way" by Norbert Christlieb et al.) that appears in the research journal "Nature" on October 31, 2002.